Top Chef Boston: I eat it; I don’t die instantaneously. We spend a little time with the cheftestants and see James’s AMAZING Patrick Swayze tattoo. I love that Patrick Swayze inspired him. I’ve been nursing a resurgent obsession with Dirty Dancing as of late (more for Jennifer Grey than Swayze, but whatevs) so I especially appreciated this moment. Soon, it’s Quickfire time! The lovely Padma Lakshmi and Boston restauranteur Todd English come out to announce it. Boston is home to the Old North Church and Paul Revere’s famous midnight ride. If you know the poem, you know the famous line: one if by land or two if by sea. It refers to lanterns in the Old North Church, but in this challenge, one lantern lights up for the land table and two for the sea table in a surf and turf quickfire. No immunity is offered, but the winner gets $5,000! The land light signals twice before the sea lights. If you’re not observant, you could miss out on good ingredients. This was the fate of Aaron who missed the sea lights and ended up with dried crab snacks. It works out for him, and we get the quote that titles this post when he tries some. Katsuji and James get top marks from Todd English, but James ends up winning the quickfire. Padma then announces the elimination challenge: cooking for Boston’s finest! The Boston Police Commissioner, Bill Evans, and the Boston Fire Commissioner, John Hasson bring their fabulous Boston accents out and help explain the challenge. This is near and dear to my Bostonian heart, with all they’ve done for us through the marathon and a scary fire in Back Bay last year. The cheftestants draw knives to break into teams to cook ~something~ for Boston’s finest. This is the order they will serve, and also the order they will pick their mystery boxes to cook. No planning is involved because they don’t know what ingredients they’ll get. In spite of that, there’s plenty of fighting on Green between Kerriann and Adam. Tom, Gale, Padma, and Boston’s finest enjoy the first three. It’s not until we get to Yellow, when the vanilla conditions you to want sweet, but doesn’t deliver. There’s also an issue with the veal chops being undercooked. Green is just as flustered in the kitchen as they were before they saw their ingredients. Kerriann and Adam are so concerned about Stacy’s chicken, which ends up being cooked perfectly. Tom goes as far as to say that Stacy should be angry with her teammates. 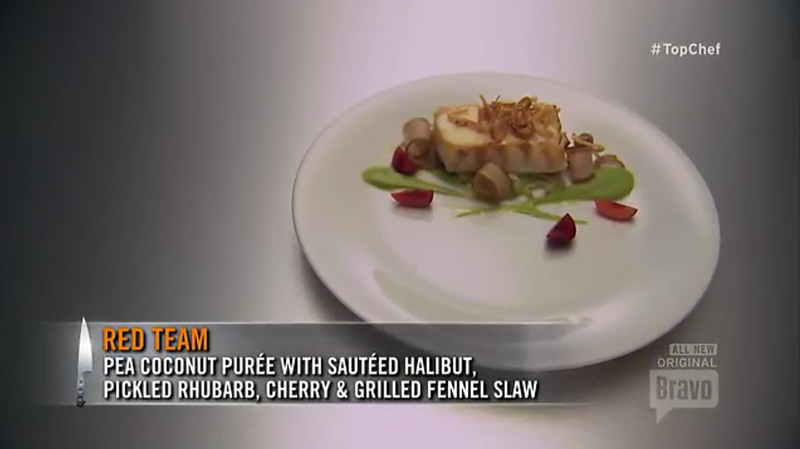 Kerriann’s corn salad and Aaron’s jam do not go over well with the judges. Red & Blue come out of top, but Blue takes the win! Green & Yellow, predictably, are on the bottom. Padma announces that Kerriann and Aaron should really thank Stacy for saving their team with her perfect chicken. Joy’s undercooked veal sent her home. While it’s always sad to see someone go, I’m proud of Stacy– my hometown girl– for doing something great for Boston’s finest and saving her team. What did you guys think of this week’s episode? I’m so looking forward to next week’s episode when we see Fenway Park and Hugh Acheson! Tweet along with me every Wednesday at 10! ← ANTM Cycle 21: I don’t have a lot of experience with emotions.